Formerly known as "Bedtime For Butterflies", this photograph was shot in our backyard late one summer afternoon. 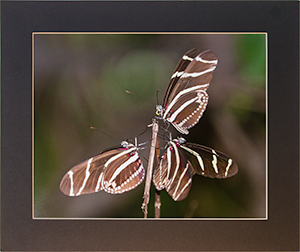 These butterflies roost together in groups of up to 60 adults for safety at night. 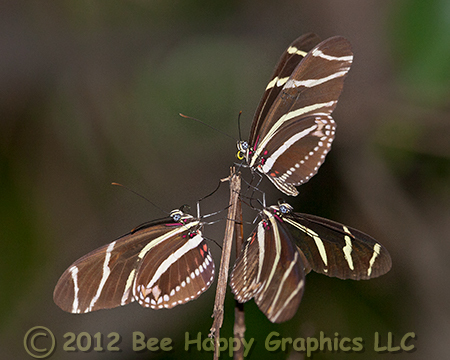 The zebra longwing (Heliconius charithonia), now called the zebra heliconian, is the Florida state butterfly. It is found throughout peninsular Florida and southern Texas south into South America. Their host plants are various passionflowers, including the corkystem passionflower, native to Florida and throughout the butterfly's range. Females deposit yellow eggs alone or in small clusters. The butterflies remain in the egg for about three days, then hatch and go through four or five instars in about 15 days before pupating (going into a chrysalis). They emerge about seven days later and last between around 100 to 160 days. Some attribute this longevity to them eating pollen in addition to nectar. Males often start mating with a female before she starts emerging. Photographic details: Canon EOS 30D camera w/ EF 100-400mm f/4.5-5.6L IS USM lens set at 260mm. Flash was used. Camera was set for 1/250 second on shutter priority with no exposure compensation, resulting in an aperture of f/5.6 at ISO 800. Fine Art Paper 12" x 15" 13" x 161/2"
Canvas N/A 17" x 21"